Hard to find ONE Level Custom Built 3 CAR GARAGE home with 4 Bedrooms and 3.5 baths plus a Large Bonus room on the 2nd Level. 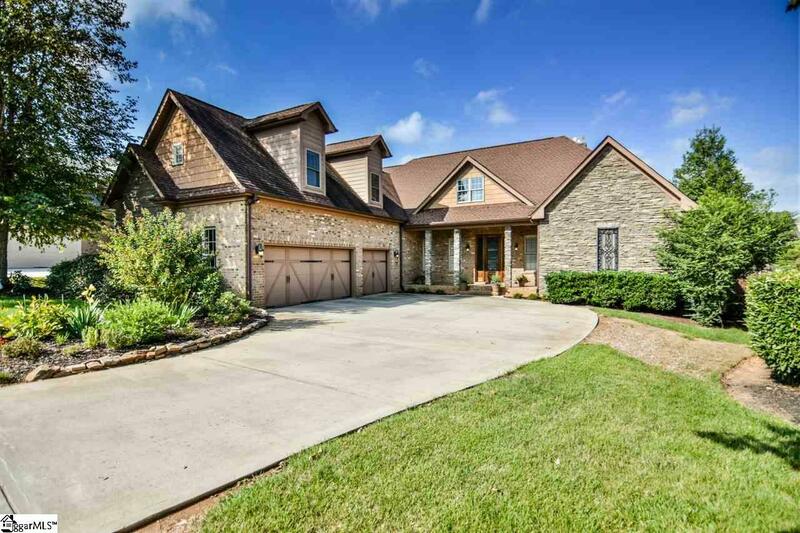 This Beauty located in Five Forks Plantation has all the Bells and Whistles you&apos;re looking for all in a desirable Five Forks Simpsonville location. Five forks Plantation offers the Best Amenities including a Clubhouse, Tennis Court , Pool, Athletic Facility, and more. CESA Soccer Complex is close by. You&apos;ll love the level yard as you enter the front through a Custom Hardwood door with Iron adornment. Inside there&apos;s a Stone Wall entrance and a Lovely Vaulted Great room with Custom Mouldings throughout the entire home. This home features a very large kitchen with a 8ft height walk in pantry, 2 lazy susans, Custom Cherry cabinets, Granite countertops with a tiled backsplash, and an island in the center. Custom Hardwood and Ceramic Tile Flooring is throughout the home. The Master on Main Bedroom is extremely spacious and has a double trey ceiling with a Large 16x13 bathroom with walkin shower and large jetted tub. It also has a large closet with custom shelving. The Owners Suite has a door that leads out to the Custom Sunroom that has stamped concrete flooring to match the front porch and overlooks a beautiful custom stoned patio. Storage will never be an issue in this home. Separate storage areas are built in to this home including an unfinished 23 x 15 walk in attic and a finished 6 x 8 room upstairs. **Owner has added updates to this home since the purchase in 2016 totaling over $70,000 Updates by the owner include Central Vac System, Glassed Sunroom, Refinished Hardwood Flooring, Iron Railing Upstairs, New Bosch Dishwasher, Stained Fenced, Stone Patio and extensive landscaping, Ceramic Tile Backsplash in Kitchen, Double 8 ft Pantry doors in kitchen, Custom Shelving in Master Bed closet, Cabinets added to the Bonus room, Epoxy on floor of garage, Hardwood Flooring added to Master Bedroom and New 5 Burner Gas Cooktop.